Carol Ann's Crafts is a showcase of unique handmade artwork created by Carol Ann 'CAP', an experienced award-winning artisan. 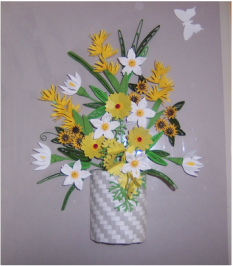 Carol's ﻿p﻿rojects include wall art, greeting cards, sculptures, arrangements and seasonal decor in many different mediums, including; paper, porcelain, botanicals, florals, wood ﻿and g﻿lass. We hope you enjoy the images of her creative work. If you would like further information about the art on this website or are interested in a custom project, please feel free to contact us!